The Complicated singer ( wow remember that track! ) has teamed up once again to write with her hubby Chad Kroger of Nickleback for new track Hello Kitty. It’s a rock pop track with a dance edged chorus, that isn't the best work from Avril however it is the video for the track is gaining a lot of attention as critics. 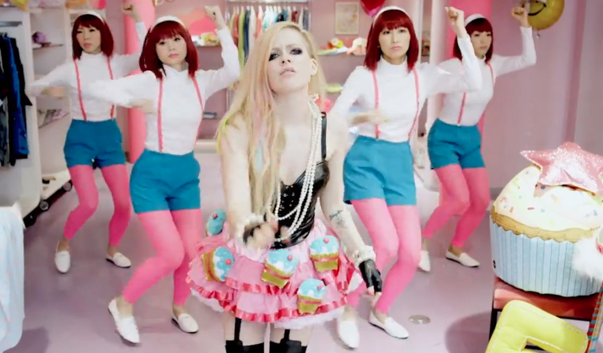 Filmed in Tokyo, critics have said that Lavigne has used four backing dancers “as props” rather than embracing the true Japanese cultures of the Harajuku girls and have even gone as far to say it is racist! Our belief is that Avril would of not gone out to make offense in the making of this video (as see in the behind the scenes below) however could have been a poor judgment from the signer and team behind the Canadian pop rock singer. Only Gwen Stefani pulled off embracing Japanese culture back in the days, however pop fans judge for yourself..! Hello Kitty is available on iTunes now..! Here is the behind the scenes - what do you think?? ?